File Undelete is a free and easy-to-use yet powerful file recovery solution that can get back data emptied from the Recycle Bin and even recover files that have been deleted by bugs, crashes and viruses for FAT and NTFS file systems! 1. The First Line Buttons: allow you to search the original disk or folders that the deleted files were on and schedule Filter to quickly retrieve the needed files. 2. 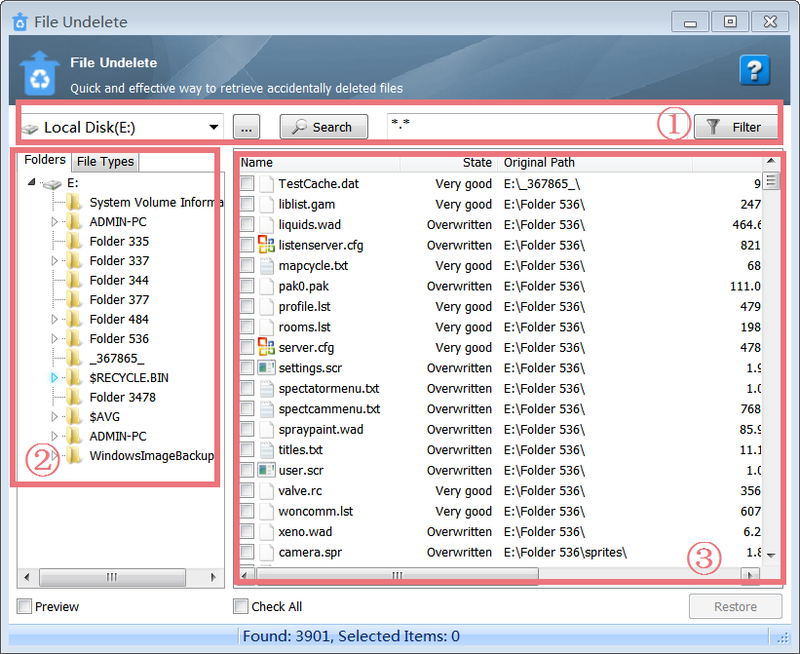 The Left-hand Side Lower Box: click "Folders" or "File Types" to easily find the files you need to restore. 3. The Right-hand Side Lower Box: All the deleted files with some information on its state, size, original path and type are displayed here. File Undelete can scan all parts of a drive, looking for a large number of your deleted files. It offers a quick and effective way to recover files from local disks or external devices and will show you a laundry list of deleted files that have been recovered on the drive. To retrieve accidentally deleted files, you can choose the original disk or folders, click "Search", and finally all deleted files will be find out. Even if you have deleted files from Recycle Bin, you can easily get files back with File Undelete. Choose the original disk that the deleted files were on when they were deleted, click "Search", and all lost files will be listed soon. Click "File Types", you will see kinds of types listed in a wide range of formats, such as JPG, FLV, RMV, MPGA and so on. Choose the right image file format, and then the related image files will be displayed on the right panel. File Filter function improves the efficiency of data recovering a great deal. 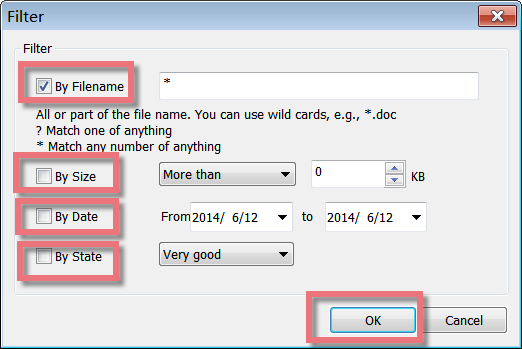 Using File Filter function, you can narrow down the list by file size, deleted date, file state. After all the deleted files are listed, enter "*asd" to filter the results you already have found, or you can set the filter items to reduce the size of unnecessary files by Filename, Size, Date, as well as State. Remember to click "Ok", "Filter" will help you display more accurate deleted files. When searching for a "Deleted File", File Undelete reads the Microsoft Windows File Allocation Table (FAT) or Master File Table (MFT) to determine if the space used by the deleted file prior to its deletion is now being occupied by other active files. To give you an estimate of the probability of success of restoring the deleted files after a quick scanning, File Undelete classifies the recovery state as "Very Good", "Good", "Medium", "Overwritten" and "Poor". Please note that if the recovery state is "overwritten", the files can not be recovered. In order to minimize the data loss, File Undelete offers users the function to save recovered files according to the user defined location. Once you have restored files, you can save recovered files to the any folder you like. Therefore, you can easily find the restored files where you saved. Click "Restore deleted file", File Undelete will pop up. Find and click File Undelete icon, File Undelete will appear. Please note: if you want to add File Undelete in the Dock bar, click in Dock bar, remove any icon by dragging it out of the Dock firstly, and then drag File Undelete in.